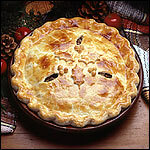 Full disclosure: Many pork pie recipes call for diced onion to be added along with the garlic. We here in the Bean household discriminate against onions. Do what you will. In large pan, saute the garlic in butter. Add pork, beef, cloves, nutmeg, gravy mix and 2 cups water. Simmer over medium heat, stirring frequently until meat is cooked. Also dice potatoes and boil as for mashed potatoes. Remove meat from heat. Render fat from meat by pushing strainer down into meat. Spoon off fat and reserve. Mash potatoes, adding nothing. Add potatoes to meat and mix well. Salt and pepper to taste. If meat mixture feels dry add fat drippings back a little at a time until desired consistency is reached. Line two 9 inch pie plates with pie dough. Divide the meat mixture between the 2 pies. Put on top crust. Wash top crust with milk. Bake at 350 degrees for 50-60 minutes. Serve warm with gravy and cranberry sauce.